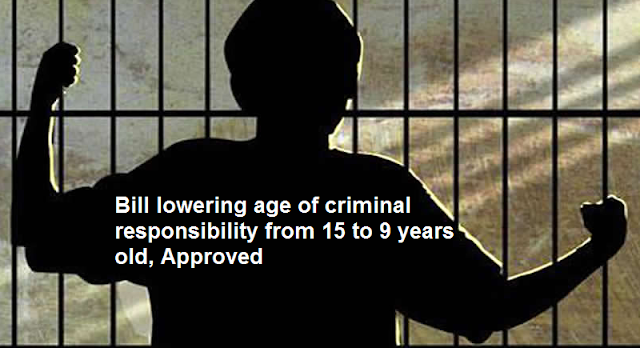 The bill which lowered the age of criminal responsibility from 15 to 9-years-old was approved on Monday by the House Committee on Justice. This means, a child nine years old and below are exemption to the rules of criminal liability, while those above nine years old but under 18 years old would be exempted from criminal liability unless the minor acted with discernment. Oriental Mindoro Representative Salvador Leachon explained that the measure is not meant to put children in jail, but to reform them. At the same time, they will not branded as criminals but children in conflict with the law. "The Committee recognizes that the youth is an integral part nation-building and the State must ensure and preserve their overall well-being," he said. He stressed out the growing number of incidents involving minors which was used by syndicates for illegal activities. However, other groups and even the Vice President Leni Robredo are opposing the approval of the bill, saying children in conflict with the law are in need of help, not punishment. Leachon is hoping that the bill will be enacted into law before the 17th Congress end in June this year, GMA news reported.